When I enrolled in business school several years back, I wasn’t quite sure what to expect. Contrary to my trepidation about being fed the “corporate” way of doing things, I ended up learning many new concepts that were, shall I say, pleasantly surprising. One of the most memorable of such learnings happened in my first management class. The professor opened the lecture by holding up a big bottle of nickels: “How much money is in this jug?”. Huh? “Write down your guess on a piece of paper and do not consult with any of your classmates”, he continued. What was this exercise all about and what did it have to do with managerial effectiveness? As we pondered its meaning, some classmates took the liberty of getting a closer look at the jug. We were allowed to hold it, shake it, gauge it with our hands, etc. Within a few minutes everyone had submitted their guesses. The professor continued with his lecture, while an assistant entered all the guesses into a spreadsheet. Soon, our professor was ready to share the results. It turns out there were $86.95 worth of nickels in the jug – 1739 coins in all. One person guessed within a few dollars of the target: $84.25, but most everyone else was way off (including me): either too high or too low. Our professor pointed out that, on average, individual guesses were off by at least $20. No big surprise there. However, when he averaged everybody’s responses together, the total came to $88.25 – within two dollars and the best “guess” overall! While very few were close to the right answer, when we aggregated everyone’s independent views, the truth emerged. That must be a fluke, right? Well, according to our professor, this was a very repeatable experiment and he encouraged us to “try it at home” (I ended up conducting the same experiment later on and came up with similar results). Our professor very poignantly used the exercise to illustrate the “wisdom of crowds” and how infrequently (if at all) executives draw upon the knowledge, opinions and expertise of a broad group of people to make better decisions. What often happens is a CEO will call upon opinions of a small few, in the board room no less. Moreover, that solicitation of feedback usually takes place in an open meeting where peers may be influenced or swayed by other viewpoints (especially if it is of their superiors). Our professor called this the anchoring effect. And it often colors decisions with imperfect information and bias. In the nickels exercise, we were asked not to consult with our classmates. Each of us was forced to come up with own conclusions independent of other people’s opinions. Had one of the other influential students perked up about their guess, it could have led many others to choose a similar number, thus thwarting the “wisdom of crowds” effect. That was just the beginning of many examples, articles and case studies that helped drive home the idea that good, dare I say, better management practices are based on principles of democracy. It has been a while since I first learned about these concepts, but it is still fresh in mind because we have been employing similar techniques in the work we do. 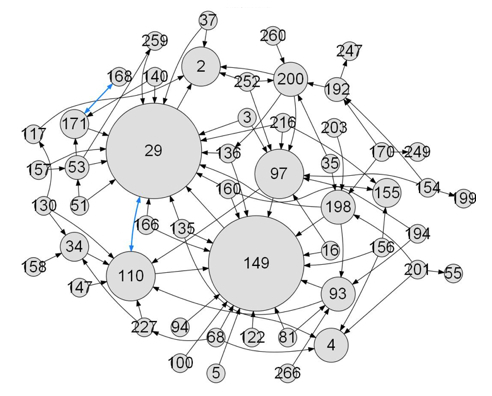 Social / organizational network analysis (SNA / ONA) takes advantage of the same principles. Everybody’s input matters and together you get a real picture of what is going on in an organization. We have started using our technology and services to not only uncover hidden networks around trust, friendship and knowledge sharing, we have begun to leverage it to help firms select their future leaders, expose under appreciated employees and pin-point vital change agents. By drawing upon independent input from vast numbers of employees, companies are making better (crowd assisted) decisions around talent, influence, team dynamics and a host of other organizational challenges. Network analysis aside, some of the most successful enterprises in the world are putting democratic principles to use everyday. It is not that employees are being polled for every little decision or given the opportunity to elect their CEO’s, but the tenets of workplace transparency, freedom and constituency-feedback is a trend that continues to grow. Companies like Whole Foods have been pioneering democratic principles in the workplace for over a decade. Organizations, like WorldBlu, are helping companies embrace democratic design and recognizing a growing list of firms that are giving their employees a new voice. Yes, democracy is on the rise, not just in the middle-east, but in our offices. Not just in business school classrooms, but in leading organizations around the globe. The “professor” referenced in this post is Jack Soll, associate professor at Duke University’s Fuqua School of Business. 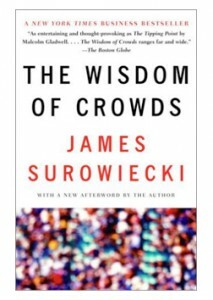 He is also cited for his work in the book “The Wisdom of Crowds”. I think so! That is what our professor was suggesting and I have had success applying the concept when using crowd input to set strategic direction and/or corporate priorities. That’s a great story & I hadn’t heard of that approximation experiment. It also gives a new perspective as to why everyone’s opinion matters when we seek solutions within organizations, rather than just always listening to the top-tier or usual suspects. Thanks for the thought provoking insight and I’m really looking forward to being able to use your methodology in my next challenging project! Thank you so much for the feedback! I am glad you found the write-up insightful. Looking forward to collaborating in the near future. I am not sure I understand how the “Wisdom of the crowds” was relevant to your class experiment. Crowd thinking in fact leads to the anchoring effect. People in a crowd are seldom isolated, physically or otherwise (media, Internet, phone, sms etc), thereby influencing each others opinions. I think what the students in your class experienced could perhaps be better attributed to whats called the Schelling Point. (In the absence of communication, people’s ideas tend to converge to similar solutions to a given problem). http://en.wikipedia.org/wiki/Focal_point_(game_theory). Thanks for the post. If the nickels exercise was an example of the Schelling Point, wouldn’t our guesses have been very similar? As discussed, they were all over the map. Averaging them together is what gave the crowd “wisdom”. Maybe if we consulted with our classmates beforehand, the guesses would have been less diverse (i.e. anchoring). In that way, “group think” can definitely lead to erroneous outcomes. That is why our professor forced us to draw our own conclusions. Diversity of opinion – Each person should have private information even if it’s just an eccentric interpretation of the known facts. Independence – People’s opinions aren’t determined by the opinions of those around them. Decentralization – People are able to specialize and draw on local knowledge. Aggregation – Some mechanism exists for turning private judgments into a collective decision. The nickels exercise captured most, if not all, of these elements and reminds us that these principles can be applied in almost any domain to help leaders make better decisions. Thank you so much for this thought-full blog post and the mention Vikas, I love the story you tell, it’s a great one and really illustrates the point. Thank you so much Traci! Best of luck for your WorldBlu LIVE conference!